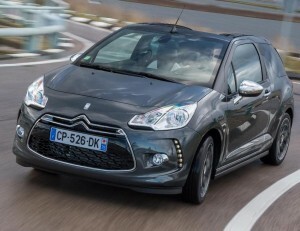 Citroen has launched the soft-top version of its popular DS3 and they expect to shift plenty of them. The car is the only five seater in the segment and buyers have a choice of seven colours, nine wheel styles and three roof designs. The DS3 Cabrio also has the biggest boot for its class at 245 litres and Citroen has introduced an innovative opening mechanism for the tailgate. They say the soft top operates at speeds of up to 75 mph, which Citreon says is unique in this segment (though I wouldn’t recommend putting this to the test since there’s a reason most manufacturers have their soft tops only work when the car is stationary) and the roof will close in 16 seconds. Since its launch three years ago, the DS3 has been a great success for Citroen and sold more than 200,000 units worldwide as well as picking up many awards. In the UK alone, it has found 36,000 buyers and the new Cabrio takes the best bits of the bestseller and adds personalisation and a decent driving experience. There are three engines in the line-up with the entry level 1.2 litre VTi being the most efficient. Citroen have added a fair amount to the spec levels including cruise control, rear parking sensors and sports suspension. There’s also a 3D LED rear lights, electric mirrors and chrome finishes to the interior and exterior. The DS3 Cabrio is available for pre-orders and will be officially on sale from 1March with prices ranging from £15,045 to £19,675 OTR, that’s around £2,000 dearer than the hatchback version. When it comes to leasing cars, the prices are generally lower than ownership because they take in a range of factors which include depreciation. It might be worth checking the leasing packages available for the DS3 Cabrio because the motor trade isn’t always as generous as it could be with Citroen’s residual values. (Don’t ask me why – I’ve happily run Citroens before without any major issues). This entry was posted in Car Updates & Releases, New Cars, Small Car, Sports Car and tagged Cabrio, caption, car, citroen, Cruise Control, Driving Experience, GM, LS, MoT, Parking Sensors, price, seat, speed, Sport, UK by Steve Lumley. Bookmark the permalink.